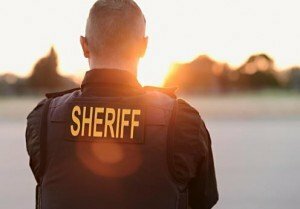 A sworn sheriff’s deputy is committed to protecting life and property through the enforcement of all applicable laws and statutes within their jurisdiction. Specific duties include, investigating crimes, apprehending and interviewing suspects, and making arrests in applicable situations. Unlike municipal police officers, sheriff’s deputies are also typically tasked with running a county’s jail complex, and ensuring courtroom security. Additionally, sheriff’s deputies are responsible for completing case reports, maintaining chains of evidence, and appearing in court to give testimony. A sheriff’s deputy can expect their work environment to be active and, at times, may be extremely stressful. Each county establishes its own requirements for hiring deputies however; one can expect that certain minimal, general qualifications will be required, which include having to be a United States citizen, a high school graduate, or equivalent, have reached the age of 21 and holding a valid driver’s license. Perhaps more important, given the nature of the position, a strong moral character is expected, and demonstrated by through a conviction record that is bereft of felonies, and past indications of drug abuse. Applicants who have previously served in the military will need to demonstrate that they received an honorable discharge upon leaving the service. Needless to say, it’s difficult to garner that much experience in community policing when you’re not a community police officer. As such, experience is rarely a requirement but it’s always welcomed. That said, those who apply with experience under their belt typically have earned it by serving on another police force or in the military. As mentioned, if the latter is the case, then they would need to show that they have left the service with an honorable discharge. Many forces offer a Police Explorer program, which gives young acolytes the chance to explore careers in law enforcement while working with sworn officers as they perform their duties. As mentioned, applicants are expected to have completed either high school, or received their G.E.D. equivalent as the minimal standard for entry into most departments. That said, specialized training in law enforcement is typically learned at formalized training programs that entails courses in a basic law enforcement academy. Once they graduate from the police academy, neophyte deputies are paired with experienced patrol officers who provide continued training as the new officers apply what they learned in the classroom to real world circumstances out on the street. For those deputies seeking continuing education, the option of pursuing an Associates of Arts degree in Criminal Justice is always open to buttress their educational credentials. Depending on the force being applied to, those who aspire to earning a detectives’s shield might need to earn a bachelor’s degree in law, criminology, or criminal justice before being assigned those additional tasks. For deputies who are looking to climb up the command ladder, coursework and degrees in business management, or industrial relations might prove an excellent choice to learn about the dynamics of running a large bureaucratic concern, budgets, scheduling, and resource management. According to the United States Bureau of Labor Statistics (BLS), compensation packages for officers vary widely by region. The leading states for compensation include: New Jersey ($84,930), California ($84,320), Alaska ($72,240), Washington ($68,920), and New York ($68,520). These amounts indicate the annual mean wage of police and sheriff’s patrol officers as of May 2012. Not all compensation packages are created equal, however. The BLS data points out that in wide swaths of territory, particularly in the southeast; officer’s annual mean salary is considerably scaled down with incomes reported in the $27,260 to $41,300 range. For obvious reasons, the primary employer of new police officers is local, state, and national government bodies. Although municipal budget crunches throughout the nation have led to uncertainty about hiring quotas in many Human Resource offices, the BLM data indicates that employment opportunities for patrol officers will not only remain stable, but are also slated to grow by a modest 7% over the next decade. Applicants are encouraged to contact the departments they are seeking to join to see about the current status of their hiring posture.